Charlie Baker and Elizabeth Warren. The Suffolk University Political Research Center/Boston Globe poll also asked likely voters about the high-profile ballot questions this fall. The poll is the first public survey of the general election in Massachusetts. In the races for Senate and governor, the two incumbents facing reelection battles on the Nov. 6 ballot have widely different swaths of support in the state, according to the poll conducted Sept. 13 to 17. Baker leads Gonzalez, 55 percent to 28 percent, in the survey. But the governor dominated among independent voters — more than half of registered voters in the state — over Gonzalez, 62 percent to 23 percent. Gonzalez is statistically tied with Baker among Democrats in the survey, 41 percent to 40 percent. Indeed, more Democrats and independents approved of Baker’s handling of his job than did his fellow Republicans. In the survey, 71 percent of Democrats approved of Baker’s job performance, while 76 percent of independents and 59 percent of Republicans did the same. By contrast, Warren’s standing in the poll reflects the partisan nature of modern politics. Eighty-six percent of Democrats approved of Warren’s handling of her job, while 85 percent of Republicans disapproved. Forty-nine percent of independents approved of her job performance. Similarly, 84 percent of Democrats in the survey said they were backing Warren in the Senate race, compared with 44 percent of independents and 5 percent of Republicans. Diehl scored support from 77 percent of Republicans, 2 percent of Democrats, and 29 percent of independents. 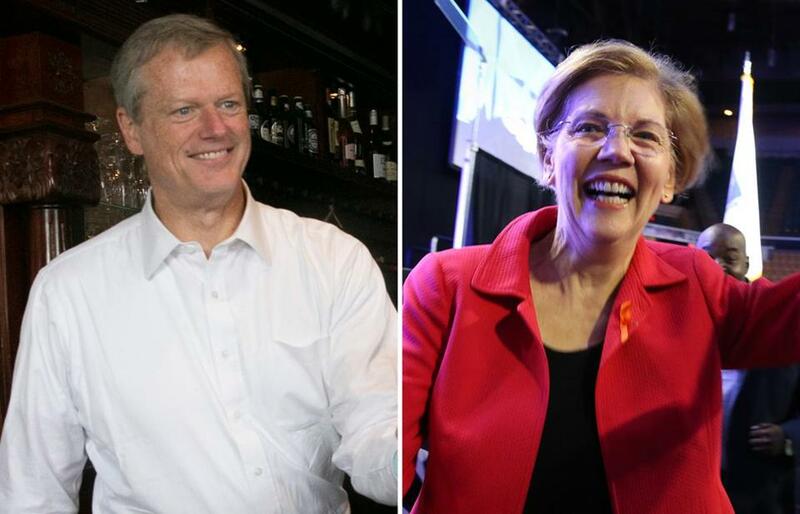 When Ayyadurai supporters were asked to choose their second choice candidate, 43 percent said they would support Diehl, while 33 percent said they would pick Warren. Rachel Britz, a 27-year-old commercial painter from Clinton, said in the survey that she is voting for both Warren and Baker. The Democrat said she has heard of Gonzalez, but she thinks “Baker is doing a good job and I like the ying-yang with the right kind of Republican with all the Democrats. “I am not really looking for an alternative’’ to Baker, said Britz. In the governor’s race, the poll showed Gonzalez with a steep name-recognition problem. When likely voters were asked whether they liked Gonzalez, 34 percent of Democrats said they had never heard of him. An additional 32 percent of Democrats had heard of him, but were still undecided on how they feel about him. The good news for Gonzalez: Among those Democrats and independents who have an opinion about him, he is generally liked. One idea working in other states may not work for Gonzalez: tying the incumbent Republican to President Trump, a fellow Republican. The poll found 61 percent of likely voters viewed Baker as “anti-Trump,” including 59 percent of Democrats. But there are also voters like Blair Collins, a 52-year-old independent from Weymouth, who says he is voting for Gonzalez because he believes Baker has not been critical enough of Trump. “Like Baker I am a fiscally conservative and socially liberal, but what Trump is doing, particularly on social issues, really upsets me, and Baker and other establishment Republicans are silent, so I want to send him and Trump a message,” said Clark. Trump remains unpopular in Massachusetts, according in the poll. He has a job approval rating of 21 percent in the state — well below his national average of 41 percent, according to Real Clear Politics. Going further, 53 percent of Massachusetts voters said the US House of Representatives should seriously consider impeaching Trump, while 38 percent disagreed and 9 percent were undecided. The Suffolk/Globe poll also asked voters about traffic congestion across the state. Some 59 percent of likely voters say traffic has either become somewhat worse or much worse during Baker’s first term. “Gonzalez would be smart to look at traffic and transportation issues because he won’t have to convince anyone that it is a problem, but just convince voters that it is Baker’s fault,” Paleologos said. In the Senate race, Paleologos said there didn’t appear to be much more Diehl could do to close the gap with Warren, beyond finding a way to mitigate Ayyadurai’s impact and focus on independent voters. The Suffolk/Globe poll of 500 likely midterm voters had a margin of error of plus or minus 4.4 percent.